According to Alex Gilkey ’21, flags are a “symbolic projection” of an organization and he doesn’t think that Kenyon’s official flag measures up. In fact, Gilkey is proposing a redesign that he believes is more concise, clear and representative of the current student body. Gilkey says that Kenyon’s flag is too “aesthetically muddled,” with its seven colors and complex imagery. “One of the basic rules is that if a child can draw it from memory, you have achieved a good flag,” Gilkey said. It would take an exceptionally artistic kindergartener to sketch Kenyon’s flag accurately. Gilkey was inspired after reading a Collegian article about the newly revised matriculation oath, which this year’s incoming class recited for the first time. The revised oath was changed to better represent students, and Gilkey believes that a similar sort of undertaking can be directed toward Kenyon’s flag. In October of last year, Gilkey contacted the North American Vexillological Association with a request to compare his redesign to the original Kenyon flag. 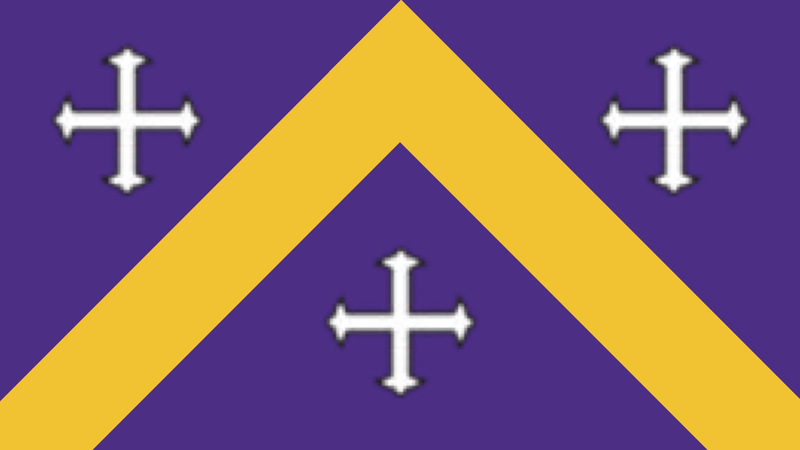 The organization responded within a week; out of a 10 point scale, the panel of judges rated the original Kenyon flag an average of 2.5 points, and they gave Gilkey’s redesign an average of 8.8. That was the confirmation Gilkey needed that he was on the right track. Gilkey first became interested in vexillology — the study of flag design — as a high schooler, after watching a TED Talk by radio producer Roman Mars in which Mars talks about the design of city flags. There is a rich history or meaning behind every flag, and Gilkey thinks that people should take flags more seriously as representations of those values. According to Gilkey, a good flag should be simple and distinctive: It should be limited to two or three basic colors, symbolically meaningful and have no text or seals. One particular favorite of Gilkey’s is the flag of Amsterdam: a red-and-black-striped flag with three white Xs across the center stripe. Gilkey thinks that now is an appropriate time for the redesign in light of all the recent changes on campus — from the College’s largest construction project in the last two decades, to the newly revised matriculation oath. Gilkey has future surveys and even a flag-designing contest in the works. He hopes that the Kenyon community will support his initiative of designing a new symbol for a changing Kenyon. This is useless redesign. And beyond that, the notion that a flag full of crosses in any way represents Kenyon's values, or any concept of inclusiveness, is disgraceful. And the flag of Amsterdam has three Xs for a reason. it is also a particularly badly-designed flag. Signed, someone who lived 16 years in Amsterdam. abigailI, along with several other current Kenyon students I know, are thrilled to have crosses on our flag and in no way feel that they represent exclusivity. Sincerely, a Kenyon student who appreciates the redesign. abigailKenyon's coat of arms has three crosses on it. Do you think the coat of arms is disgraceful, too? abigailHi, Abigail! First off, I want to say I understand where you're coming from with the idea that the image of a cross doesn't represent inclusiveness. However, I did not intend to use the crosses in my redesign as a symbol for christianity. My original idea was to give the crosses the following meanings: each will represent the three academic paths of Kenyon, which are arts, humanities, and both the social and natural sciences. I actually got the idea from flag design of Washington D.C., which took the coat of arms of George Washington and tuned the central design into the cities flag. I understand that while crosses already have an inherent tie to Christianity on our coat of arms, that was not their intended purpose for use on the flag. On the topic of the Amsterdam flag, I'll admit I chose it as a favorite simply out of design and not based on its meaning. After researching it, I found that while there are lots of stories about what the three X's could mean, such as symbolizing fire, floods, and the plague, the decriminalization of marijuana in coffee houses, or certain types of entertainment in the city are all unconfirmed reports. Could you give some input, as you lived there for 16 years and would know better than I or the unofficial websites I tried? Gilkey, this is pretty darn cool. I'm glad some Kenyon Kids are up to stuff like this. I'd debate with you on the inherent virtue of simplicity in flags, but I think we might come to an understanding (flags versus seals). Anyway, keep up the good work.